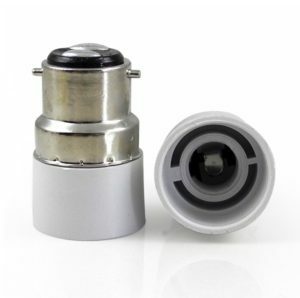 E27 To B22 Adaptor Converter, a light bulb sockets converter of light bulb with B22 base to adapt an E27 fitting socket, it is suitable for LED, halogen, filament or CFL light bulb. The light bulb adapter converter is easy and convenient for you to install and use for its practical and useful design, it will bring great convenience to your daily life. Items are made of High temperature resistant ABS/Ceramic materiel.